In addition to the White and to the Valued Black, there are at least other seven-eight species of truffle in Umbria to favour every recipe. This region, with its sweet hilly landscape of which the forest is a predominant part, is a big truffle-ground: only this region can oppose to the fine sapidity of the wrinkly black truffles, the unique acuteness of perfumes of the aristocratic white truffles, and we should add, together with an entire serie of "in-between season" truffles, the particular fragance of the summer "Scorzone". The Umbrian Valued Black Truffle Ripens from November to March; its area of diffusion includes all the territories bordering the course of the Nera, of the Corno and of the Sordo rivers, the hillsides of the mountains of Spoleto, the martani Mounts, the Mounts of Trevi and the Subasio. Its size can vary from the size of a nut to the one of an apple or an orange. The bark is blackish or directly black but, even it is wrinkly. Its pulp is of colour black-purplish, with fine veins of white colour which, are taking colourations brown-reddish. This species is present at an altitude than can go from 250-300 meters up to 900-1000. The picking is made only in precise periods of the year, which is at ripe spore, and exclusively with the help of the dogs, in order to avoid a useless "hoeing" of the land that would compromise forever the precious "mycelium". 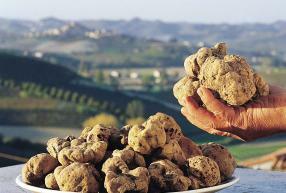 The white truffle is even rarer and more valued. The production area is the Tevere Valley, the regions of Gubbio, Gualdo and Orvieto. It arrives to maturation from October until all December, but in areas particularly protected from the frost we can find it during the entire month of January. It vegetates at a higher depth than other truffle. It prefers the contact with some higher plants such as the poplar, the willow and the harrier. The fascination of the white truffle has a lot of components: the sharp perfume, the size and the form, which has to be as regular and rounded as possible, the matchless savour that best expresses itself served raw without the need for salt or seasonings. The size can vary from the size of a small nut to the one of a big orange and presents itself in a subspherical form variously rounded with pimples and emergent horns. Its pulp has a colour going from light brown to dark brown. Sometimes, when the plant with which it is living in symbiosis is a lime-tree or a oak, it is pink, with a tendency towards red. Is served cut in very thin slices. Because its aroma is more decisive it is better to serve it with simple warm dishes that enhance the aroma.